One of the more difficult items to figure out from measurements alone is just how much chain a lock or anchor can accommodate. As some examples might shed some light, here are some pictures of the Oxford Anchor 14 and the Abus 92/80. Note that this is not a review, as such. I have absolutely no interest in debating the merits of these devices, and I don't even want to mention the word "p*ck*ig" for fear of getting this blog mixed up with all of those videos of yahoos people who want to show off their mad skillz hard-earned skills. I just want to show what these devices physically can and cannot do. As previously mentioned, the Oxford Anchor 14 is - well, enormous. Really. From the photos and measurements available on the 'net, I figured it was likely to accommodate a single loop of 7/16" security chain. It turns out this was vastly underestimated. This certainly seems to show that it can hold one, or maybe two, loops of chain. 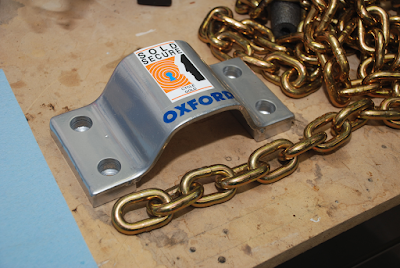 Given the anchor fits "all Oxford security chains", their largest is 1/2", and marketing people love to show off, it sure looks like a single loop of 1/2" chain might be the maximum capacity. And here it is holding no less than FOUR loops of that same chain - with room to spare for more. I'd guess 6 or 7 loops would be no issue. With a fabric chain sleeve, maybe you'd be down to 4 or 5, but I doubt it. Obviously a single Anchor 14 will do for just about any practical purpose, regardless of chain size. So you needn't worry about the anchor fitting your chain - you only need to worry about having a space big enough to mount it. The Abus 92/80 was another question. It's a damn big lock, and both measurements and reviews said it would accommodate two end loops of 3/8" or 7/16" chain without difficulty. Sure enough, that was the case. 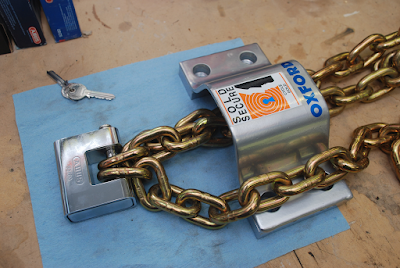 Incidentally, it did not really sink it for me until I tested it that this lock also has a minimum chain size, as the locking hasp is relatively thick. 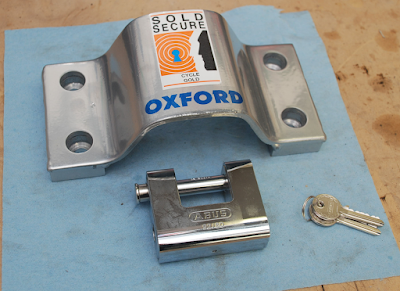 If the links are too small, the hasp simply will not fit through them. I had calculated all of this while selecting my lock, so I knew it should be OK. But it didn't really come to the fore until I tried it out. I'd say that anything much less than 3/8" chain would not work at all. Of course, chains are rarely precisely the right length. Since securing a chain tightly can help defeat those with bolt cutters, you often want to secure it in the middle somewhere. What I could not tell - except by test - is if the Abus would also fit an end link plus a middle link. It turns out it will do so without a lot of difficulty. 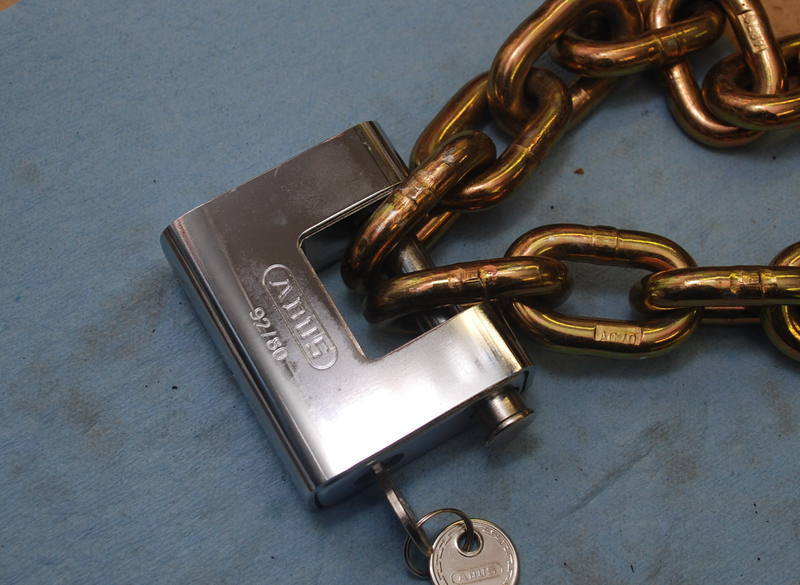 This naturally led to the question of if the Abus could even accommodate securing two middle links. Turns out it will even do that, but only just. Despite the above, I would not recommend trying to use two middle links in any practical situation. You can make it work, but it just barely fits. 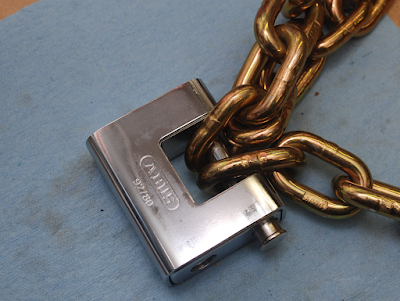 This makes it quite difficult to actually secure the chain in the lock, especially if access is awkward in any way. I was able to make it work on my bench, but real life applications rarely allow such freedom of movement. 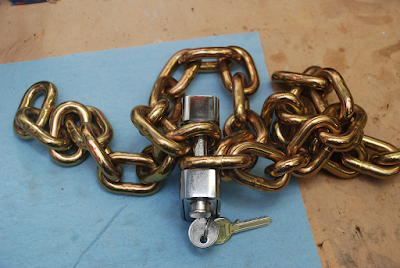 If the chain is relatively loose and the lock is right in front of you, you may be able to make it work. For most applications, though, I'd recommend using one end link and - at most - one middle link. I do not know if two middle links of 7/16" or 1/2" chain will be worse or better than the 3/8" shown above. The links are a bit fatter, but also longer, so possibly it will even out? You'd have to try it out to be sure. And no, I'm not planning to use the Grade 70 chain for my actual security needs. 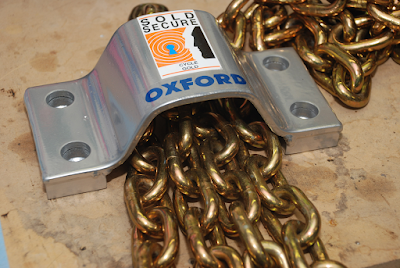 Not that there is anything wrong with that - it's a damn good chain, IMHO, and will be enough to deter most thieves. No, the Grade 70 was just the biggest chain that was available off-the-shelf in my area, and made for an excellent (and relatively cheap) surrogate for my preferred chain. Which was extremely costly, 4 weeks away, and non-returnable. Hence all the testing - I'm not dropping hundreds on a combination that will not work together!